Hand cream is one of my essentials for winter. I always have a tube in my bag, on my bedside table and scattered around the house, I’m sure I’m not alone with this. Here are the one’s I’m currently using and loving with the exception of L’occitane which I seemed to have misplaced. You can read my review here. 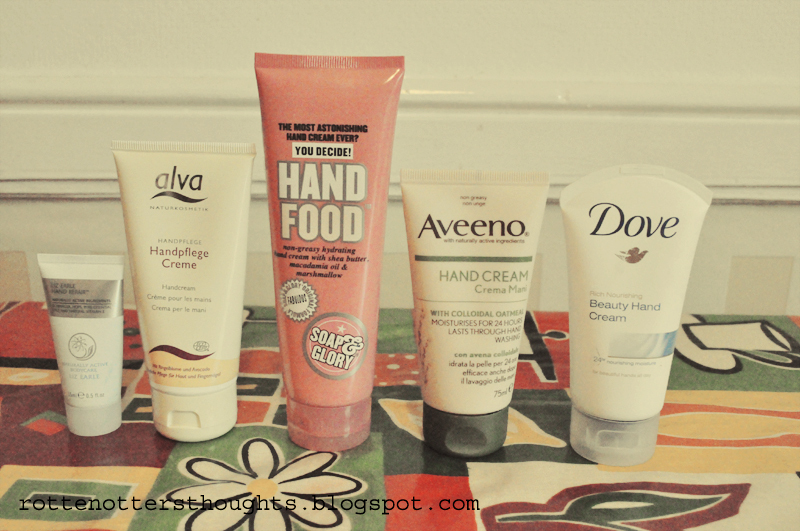 Liz Earle Hand Repair, Alva Naturkosmetik Hand Cream, Soap And Glory Hand Food, Aveeno Hand Cream, Dove Beauty Hand Cream. Disclaimer: The Alva hand cream has sent for free as part of mypures blogging panel. The aveeno handcream was sent as part of the Aveeno discovers progrmme. Im using handfood at the moment! I just love everything about it, esp. the smell! I am currently using hand food and I love the smell, it's so yummy!